What Is a VA Form 10-2850C? VA Form 10-2850C, Application for Associated Health Occupations is a form used to apply for a job in the associated healthcare occupations within the Department of Veterans Affairs (VA) and its sub-agencies: the department's central office, the Veterans Health Administration, the Veterans Benefits Administration, and the National Cemetery Administration. The gathered information will be used to assess an applicant's suitability for employment. 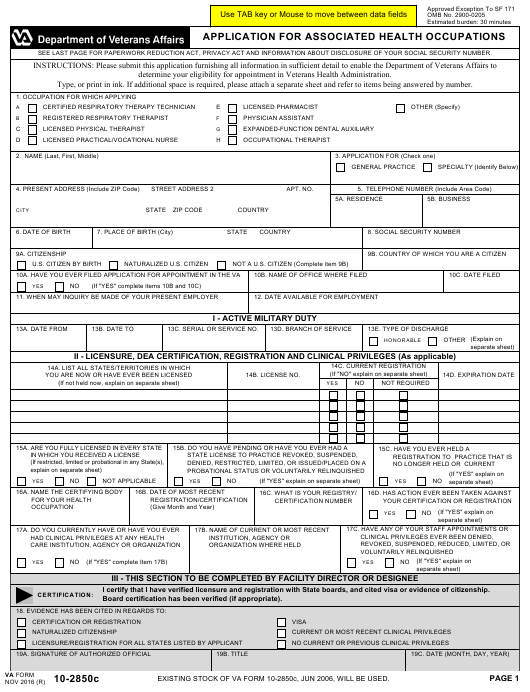 The latest version of the form was released by the VA in November 2016 with copies of the June 2006 edition available until exhausted. An up-to-date VA Form 10 2850C fillable version is available for digital filing and download below or can be found on the VA forms website. How To Fill Out Va Form 10-2850c? SEE LAST PAGE FOR PAPERWORK REDUCTION ACT, PRIVACY ACT AND INFORMATION ABOUT DISCLOSURE OF YOUR SOCIAL SECURITY NUMBER. determine your eligibility for appointment in Veterans Health Administration. Type, or print in ink. If additional space is required, please attach a separate sheet and refer to items being answered by number. 13C. SERIAL OR SERVICE NO. I certify that I have verified licensure and registration with State boards, and cited visa or evidence of citizenship. Board certification has been verified (if appropriate). EXISTING STOCK OF VA FORM 10-2850c, JUN 2006, WILL BE USED. 25. NAMES UNDER WHICH YOU WERE EMPLOYED, IF DIFFERENT FROM NAME GIVEN IN ITEM 1. 26. LIST ALL PUBLICATIONS, SCIENTIFIC PAPERS, HONORS, AWARDS, RESEARCH GRANTS, FELLOWSHIPS (If additional space is required, attach separate sheet). qualifications during the past five years. upon military, Federal civilian, or District of Columbia service? relative's (1) full name; (2) relationship; (3) VA position and employment location. Within the last five years have you been discharged from any position for any reason? discharged, or after questions about your clinical competence were raised? now under charges for any offense against the law not included in 33 above? be punished by fine or imprisonment (U.S. Code, Title 18, Section 1001). TRUE, CORRECT, COMPLETE, AND MADE IN GOOD FAITH. includes the time it will take to read instructions, gather the necessary facts and fill out the form. States Code, Chapters 73 and 74.
your separation or resignation as a professional staff member under circumstances which raise serious concerns about your professional competence. boards and the National Practitioner Data Bank. The information you supply may be verified through a computer matching program at any time. personnel policies and thus may prevent you from obtaining employment, employees benefits, or other entitlements. who have identical names and birth dates, and whose identities can only be distinguished by the SSN. The form is distributed without any filing guidelines. Detailed step-by-step filing instructions can be found below. The first box of the form contains the occupations available for application. The applicant must select "Other" and identify the occupation if the desired position is not featured on the list. Boxes 2 through 12 should contain the applicant's personal information. This includes their name, address, date, and place of birth, SSN and citizenship information. Box 3 is filled in if the candidate is applying for a certain specialty. If the applicant had ever filed the application before, this should be specified in Boxes 10a through 10c. Section I describes the applicant's military service. The individual must specify whether or not they have served on active military duty. If the answer is negative, the section should be left blank. Box 13e requires the type of discharge. Other-than-honorable discharge requires a further explanation on a separate sheet of paper that must be attached to the form. Section II pertains to licensure: DEA certification, registration, and clinical privileges - if applicable. The applicant has to provide full information on their licenses: where and when the license was obtained, the number of licenses, the current registration, and an expiration date. Boxes 15a through 15c require information regarding any problems with the license: whether it was restricted, suspended or denied in any state. Boxes 16a through 16d require the certifying body for the current occupation, the most recent certification date, and its number, the specification, and whether or not any action was taken against certification or registration. Additional sheets may be used to include all the certifications or to explain the information given. Section III is to be completed by the reviewing agency. Section IV provides information about liability insurance. It is filled as stated only if applicable. An applicant's qualifications must be described in Section V. Boxes 22a through 22e specify the name of schools, their address (including ZIP code), the program length, the date of completing the program, and the documents that verify attendance (a diploma or the awarded degree). Section VI describes the previous professional experience. Column 24a is for listing the names of previous employers, Column 24b is for providing their addresses and Column Box 24c is for specifying the occupation in every case. The form of contract - either full or part-time - is identified in Column 26d. If the applicant was a part-time employee, the average number of hours per week is given in Column 26e. Column 26f indicates the period of employment for each place of occupation. Section VII provides space for any additional information. Box 25 is filed by applicants employed under any names other than the one specified in Box 2. Any publications, awards, grants or fellowships should be listed in Box 26. The qualifications for every candidate must be provided by qualified professionals not related to the applicant by blood or marriage. These people should be listed as references in Section VIII, Boxes 27a through 17d. Boxes 28 through 37 contain yes-or-no questions that need to be answered by the applicant. These include questions about any previous convictions or imprisonment, being discharged from a position and having Federal debts. The applicant must certify the provided information by signing the form in Box 38 and once again in the space provided on the fourth page of the form. How do I save VA Form 10-2850C in a fillable format? You must have the latest Adobe Acrobat Reader installed on your computer or mobile device in order to save the data within the PDF. How to electronically sign VA Form 10-2850C? Open the file you want to sign in Adobe Reader and select "Add Signature"
Select "Type" to type your name and have it converted to a signature. Select "Draw" and draw your signature using your mouse, a touch screen or a stylus. Select "Image" to upload a scanned and cropped picture of your actual signature. There are several forms related to the VA 10-2850C and intended for specific occupations. VA Form 10-2850, Application for Physicians, Dentists, Podiatrists, Optometrists & Chiropractors is filed by specialists applying to one of these positions in Veterans Health Administration to prove their eligibility for appointment. VA Form 10-2850A, Application for Nurses and Nurse Anesthetists is used by the applicants to describe their education and professional experience and provide professional references to prove their eligibility for appointment. VA Form 10-2850D, Application for Health Professions Trainee is filed by individuals applying for the VA clinical training program. The data provided in the form may also be used for making pay and benefit determinations or personnel administration if an applicant is employed by the VA. The series also used to include the now obsolete VA Form 10-2850B, Application for Residents.